Customers can order Singing Valentines at this link. 6:30 Singing Valentine Quartets. Time for all valentine quartets to come and work on your songs. 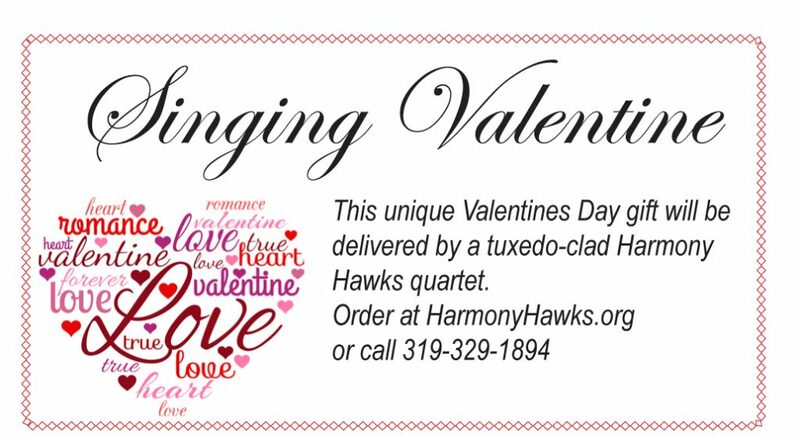 Next week we will schedule also the 6:30 – 7:00 rehearsal time for the quartets who will be delivering Singing Valentines. There will be more of these scheduled prior to February 14. We are looking for one more quartet to sing. If you are willing to sing in a quartet, please let Greg know. For the last couple weeks, I have noticed that not all attending chorus members are at rehearsal at 7:00. People have been trickling in until about 7:15. Warm-up time is important for preparing to sing and for learning to be a better singer. You might even learn something about another chorus member! I realize that there are reasons why you may not always be there at 7 but please make an effort to be ready to get on the risers at 7. If you are purposefully arriving late to skip the warm-ups, please let me know the reason so we can look at making changes to the warm-up routine. Welcome from the River City Chorus in Mason City. As president of the chorus I would like to announce that our chorus will be sponsoring a Harmony College Midwest on August 2th,3th,4th . The event will be held at NIACC community college in Mason City. Our guest quartet and coaches will be Instant Classic along with other professional coaches. So if your chorus ,quartets or individuals are looking for a chorus retreat,a coaching session before contest or just to improve your singing. Consider this college for yourselves! The event will include an afterglow before the college, yes I know we are starting with the best part ,on Friday night. Breakfast on Saturday followed by coaching sessions , a noon meal and more sessions in the afternoon. Then a show Saturday evening starring Instant Classic. Sunday morning will include a breakfast and a group sing church service where each chorus or individual who have pre registered will receive four newly arranged gospel songs by River City Chorus director Jayson Ryner to keep and take home to their home choruses. Therewill also be an opportunity to participate in just the Saturday event if a chorus, quartet or individual are interested. The housing will be at the new air conditioned dormitory at NIACC and will be included in the registration fee. The pre registration fee will be $125 per person which will include everything listed above . If you can’t make the whole weekend, join us Saturday for a day of coaching , noon meal and Saturdays show for $80. So please consider joining us at our first Harmony College Midwest to improve and enjoy singing with other barbershop singers in the area. We would like to have the preregistration done by March 9th. A flier will be sent to each chapter with a registration and additional info. For more information contact myself at tpoppens1@gmail.com or Stan Zinnel at (641)380-0406. Thank you. This entry was posted in Board and staff notes, Performances, Weekly Updates and tagged a cappella, barbershop, music, Serenade, singing, Singing Valentines, Unique gifts, Valentines Day. Bookmark the permalink.